Rejoice! It’s soup season, people! Making soup can be a long, simmer-all-day process, but some recipes are perfect for fast, last-minute dinners. I wanted to add a quick weeknight soup to our roster of 22-Minute Meals, and an easy chicken tortilla soup seemed like the perfect candidate. Yeah, you read that right, I said nachos! In an ode to one of my favorite soups of all time—French onion—I decided to top my chicken tortilla soup with two crispy bean and cheese nachos. So get those going first: preheat your oven to 400°F, place two corn tortillas on a rimmed baking sheet, brush with oil, and start baking. Slice the other two tortillas into 1-inch strips and chop the onion and garlic. Then, slice the chicken into 1/2-inch-thick strips. If the breasts are thick, cut the strips in half lengthwise so they cook quickly and evenly. Meanwhile, check back on those nachos-in-the-making. After the tortillas have baked for five minutes, flip them and continue to bake until crispy, four or five minutes more. Heat some oil in your pot and sauté the onion and tortilla strips for about three minutes. 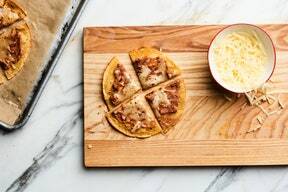 Once the tortillas in the oven are nice and crispy, spread them with refried beans, season lightly with salt and cumin, and top with shredded Monterey Jack cheese. Bake them until the cheese is melted and browned, about five minutes more. When the onion and tortilla strips are softened and lightly browned, add the garlic and the cumin to the pot and cook until fragrant. Add the broth, tomatoes, chiles, adobo sauce, salt, and pepper. Cover the pot and increase the heat to high to bring the temperature of the soup base up as quickly as possible to a gentle simmer. Once the nachos are nice and melty, let them cool slightly on a cutting board, then cut each tortilla into four wedges. Bean and cheese nachos are the crowning glory on this soup. Uncover the pot, reduce the heat to medium, and add the chicken. Gently simmer until the chicken is cooked through, about five minutes. Squeeze the lime juice and get your garnishes ready for topping. I like them all: lime wedges, avocado, radish, and cilantro, but you can choose which ones you’d like to include. Remove the pot from the heat and stir in the lime juice. Season with extra adobo sauce, salt, or pepper if you like. Ladle the soup into bowls, add the nachos and your toppings of choice, and enjoy!